This book immediately intrigued me. I kept seeing Passenger on social media and on other blogs. The cover is gorgeous! That, was the first thing to grab me. And then I heard that it was about time travel. And a mystery. With a bit of romance. And lots of adventure. And I had to read it. Seriously, a book about time travel was enough to intrigue me. But once I started reading, I fell in love with Etta. First, her name. It’s lovely and fun and quirky. And, I fell in love with Nicholas too and immediately wanted to know more about him and understand his situation. As I read on, I liked them more and more. The concept of people who can travel through special passages that only they can find to different points in time is already great. But Etta’s sudden entry into this world and it’s politics allows the reader to learn about it with her, slowly, while in the midst of some crazy adventures. I felt like I was reading a flowing body of water. Before I talk about more characters, can I take a moment to talk about the writing? I really liked Alexandra Bracken’s style! The language is beautiful. I felt like I was reading a flowing body of water. At times, it wasa smoothly trickling stream, and then suddenly it would be a swift river. The pacing and the stakes changed so suddenly, intensified, and moved me along the story frantically trying to find a place where I could stop reading and go pee, but I couldn’t find one. I had to keep reading. It was a physical need. At a few points, the river hit some rapids. Boulders popped up out of nowhere and took this book from a solid five stars down to a four for me. I loved the franticness of Etta’s journey and search, but at times these rapids, bits of information of super fast pacing confused me and pushed out of the story to ask what happened or what was going on. I had to keep reading. It was a physical need. A big part of wanting to keep reading this book were the antagonists. There are a few of them throughout the book and they are intriguing and whole. They have real motivations, as all the characters to. And they have fabulous dialogue. 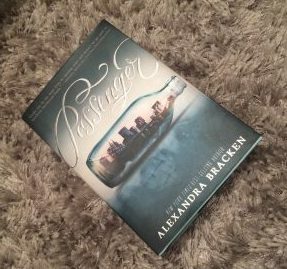 The world that Alexandra Bracken has created, with certain families able to time travel through passengers, and with their own battle for dominance amid the realities of history, is incredibly interesting and felt well-researched. This story left me wanting more. Bracken has masterfully given us readers just enough information to follow along and be gripped in a deep attachment to these characters and their stories, but not enough that we can be satisfied. We need more. When I finished, I experienced, for the first time in some time, a severe book hangover. I wasn’t ready. I had to tweet (and you’ll notice she responded! :D). @trishajennreads You just made my whole day! Thanks so much for reading!! I’ve been seeing this book everywhere too. It looks like a good one so thanks for the review. I’m adding it to my wish list! It’s sooooo good! I can’t wait until the sequel comes out. Enjoy! I had the same reaction. Passenger was addicting and so well written! I’m so happy that Jaguar is only a few weeks away! Have you read the synopsis for Wayfarer yet?